Welcome to another month. When we left you in January we had just left Inverell , heading to the NT. 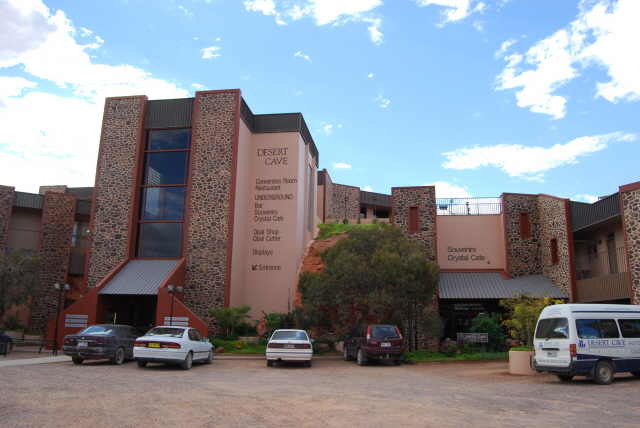 The first night we camped at Cobar, next night Broken Hill and then onto Port Augusta. It was bloody hot, but must say that we all slept well in the camper with our expensive little 12 volt fans running all night. They might be $120.00 each, but if you can sleep comfortably all night in that heat, they are worth twice that. Each of these stops were one nighters, pulling in each afternoon usually by 3.00pm which gave us time for a swim and to wind down a little, ready for the next day. Next it was off to Coober Pedy. This is one of our favourite SA destinations, simply because it is so incredibly different. On our last trip we really wanted to stay underground, but as we were watching our pennies we stayed in the caravan park. Not this time, for two reasons. Firstly it was about 45 C and secondly as part of our contract for working in the NT, all of our travel expenses are paid for, so bring on the cool accommodation. 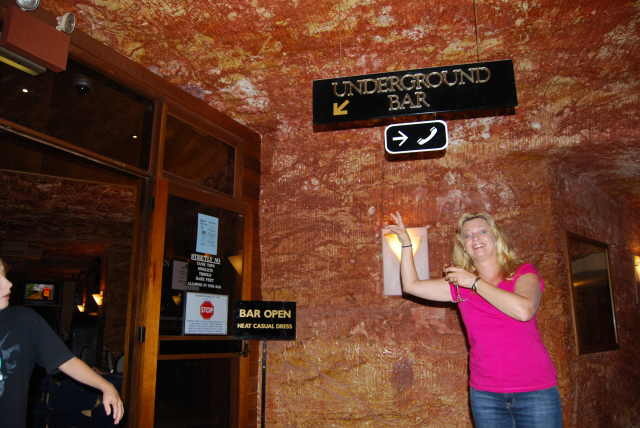 We did a drive around town and checked out all the underground motels, but decided on the "Desert Cave" which is the big flash one in the main street. They had a good deal on at the time and a nice big pool. We had a two bedroom apartment that was fully underground and very flash. While it certainly was novel, I am not sure it would do your mental health any good living underground in the constant dark like a mole, day in, day out. When all the lights were turned off it was seriously very very dark, but it was also very cool, which was a pleasant change from outside. We had a swim, had a cool ale in the underground bar and headed to the local pizza and pasta shop straight across the road. This is where the locals go for takeaways/dine-ins and there was a constant stream of very colourful folk picking up their orders while we had our meal. You would have to be a special breed to live here on a permanent basis. Now as you may be aware our life is a work in progress, living in constant change. Well as you might have read last month we were heading to Elliott, 750kms north of Alice Springs for 6-8 weeks work, prior to doing the Simpson Desert. 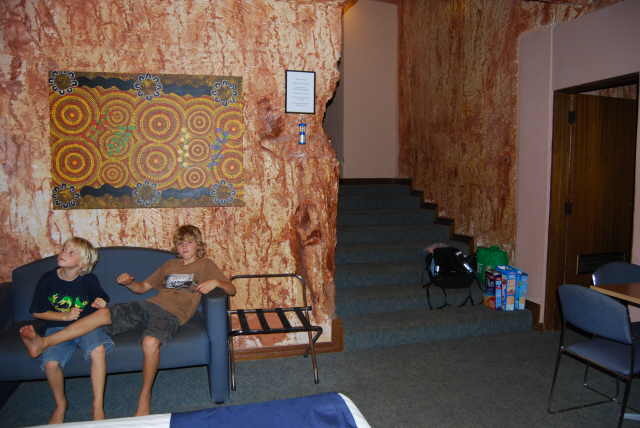 Well just after we arrived in Coober Pedy the phone rang. There was now a problem with Elliott as nobody had thought to check out the accommodation situation, with only a one room flat available. Clearly that was not going to cut the mustard, so Jane had to find us yet another destination. The next choice, Laramba was actually better as it is only 200kms up the Tanami (track) from Alice Springs, close to the back of the West McDonald Ranges. The Clinic manager was finishing up after 4 years so I was being sent out to replace her until a permanent replacement could be found. 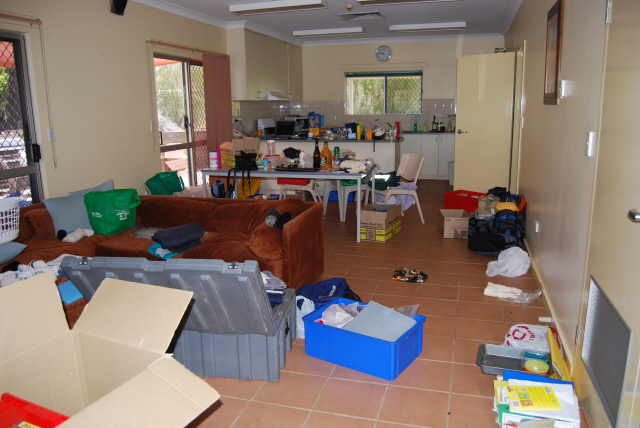 Before heading to our new destination we had to detour to Yulara to collect our gear that we had left there last year. A friend out there had collected it all for us and taken it around to their house. 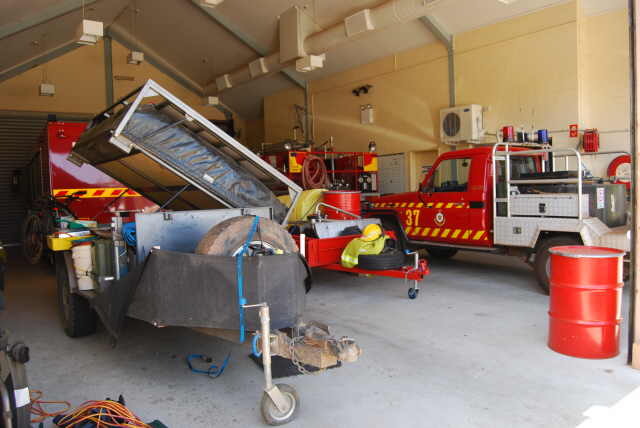 We arrived at Yulara late in the afternoon and went straight around to the Fire Station, which is where we were staying. It was great to see the Murphys again and it was great that we were able stay in the station visitor's accommodation as it was very hot. We stayed with them for 3 nights. The first night we went up to the Res club, which was really good as there were heaps of people up there that we knew. The next night a few people decided we should have a barbeque at the oval to farewell the Parfitts. It was a really nice gesture and a nice night with about 20 or so turning up. While it was sad to leave, we do have a new adventure ahead that we would have missed out on if we had stayed in Yulara. I think we will look back at this and be very grateful that they stuffed us around and that we moved on. We can always go back there in the future if we still wish to. Our days were spent going through all our gear and deciding what to keep and what to send home. I must say we nearly had a heart attack when we first saw what we had left, but it wasn't actually that bad when it was packed properly. We ended up sending 2 packing boxes (small tea-chest size) back to Bundaberg on Greyhound. Bus freight is a very cost effective way to send small quantities of gear home. So now with the camper repacked and the second solar panel fitted on the top, it was off to Laramba after spending a night in Alice Springs to get some groceries. Now Laramba is a little unusual. It is an Indigenous Community of about 350 locals give or take a hundred or so. It is stuck right in the middle of a 1.3 million hectare cattle property called Napperby. The Tilmouth Well Roadhouse which is on the Tanami is owned by, and is part of the property. There is currently 6,000 cattle on the property and just prior to Christmas there was 11,000. That is a lot of cows. There are 3 large diesel generators almost in our backyard that are owned and managed by NT Power and Water. These engines use 5,000 litres of diesel a week that costs over $1.50 a litre. That is over $7,500 a week, just in diesel, just to make the power for a few houses. They are a bit noisy but because they are going 24/7 after a while you don't even notice them. I think all of our air-conditioners are noisier. Our house is amongst 3 others about 2 kms from the community towards the Station houses, where some other white fellas live. 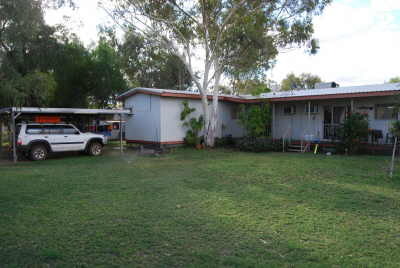 It is a large 3 bedroom, fully air-conditioned place with a large yard of green grass and magnificent ghost gums. It is very comfortable. 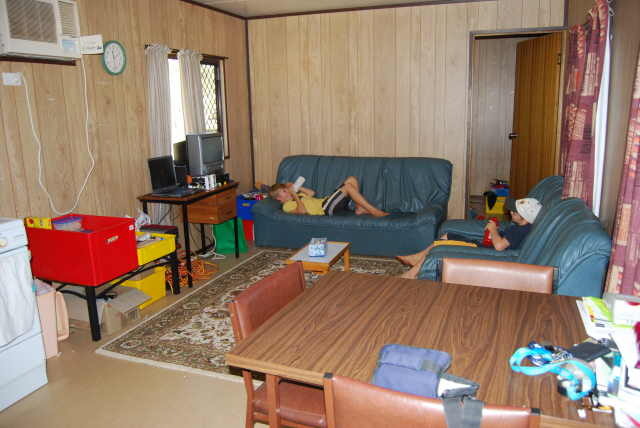 I did forget to mention that for our first 2 weeks we did live in a very small Donga that was hot, stunk and was so small we were falling over each other, waiting for our house to become vacant. Moving into the house was quite a relief, except that the solar hot water had chucked in the towel, so out from Alice came two plumbers to get it going. Then on the same day we noticed the toilet bowl would not empty properly. Well by day 2 we had the toilet full of crap (literally), with the water absolutely to the top of the bowl, trickling onto the floor. What a bloody sight and the smell, well let's not go there. A few more distressed phone calls and finally some joy. After only one night of using the back yard as a toilet (seeing Chris out there with the headlight terrified a snake was going to bite her on the rear was a classic) Kenny the crap doctor arrived with his pump truck and finally the toilet level went back to normal. A few days later out came the plumbers and the excavator and all new soakage trenches dug, with the only casualty being one small tree. Now that we have the luxury items like hot water and a flushing toilet sorted, we can persue other interests. (Now we just have the odd power failure and water going off.) Boy am I glad we are not paying the bill for those repairs. So what do we think of this place? It is actually a nice spot and is growing on us all. 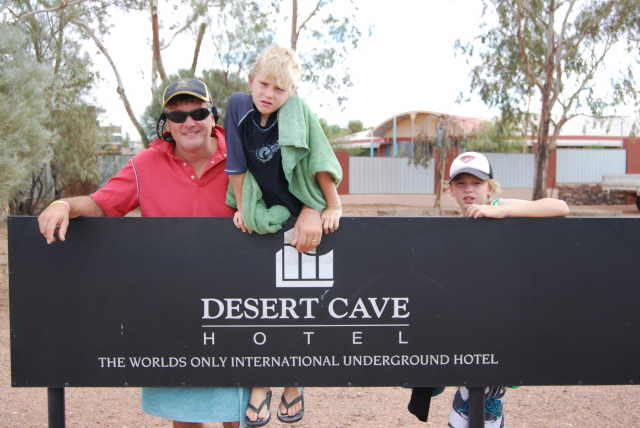 There are very few other white fellas (and few that you would really want to get to know) and while we are very comfortable, close to the West McDonalds and close to Alice Springs (well only 2 hours) this is not a place we will be at for very long. The locals are a very nice, friendly and placid mob. There is a store in the community which sells most things and another at the Station that even has fast food (not that I would eat it). We get mail once or twice a week, although we send a driver into town most days, taking in patients that have appointments, so we can always get things picked up. So what are our plans. Changing, changing and changing. We had planned to sit it out here until it got a tad cooler and then do the Simpson Desert prior to heading over to Western Australia. We even had friends, Pat and Roger from QLD coming with us until parts of QLD got flooded, which in turn floods the channel country (around Longreach way) which in turn floods part of the country that we were going to cover. The best advice we could get from the experts was that it could be many months before the French Line to Birdsville would be open. So we were stuck with the dilemma of do we wait here longer until it dries out a little, or do the desert later and head straight across to the West. Well let us think for a micro second. Let's get going. So at this stage we will be heading off from here on the 27th March, via Kings Canyon where we will spend a few days with the Murphys and then to Ayers Rock for a few days over Easter, through Docker River and across to the West Coast on the "Great Central Dirt Track Highway". We will then have just on a month to make our way up to Broome and across the Gibb (River Road) to Kalumburu where we have a 6 week work contract arranged, starting on the 4th May. Following our stint there we will have 2 weeks to wander back to Broome to meet up with the Joiners for a month exploring the Kimberleys. We will then most likely spend the next few months somewhere in the Kimberleys, hopefully around Cape Leveque. So that is pretty much it. We are out here in the middle of nowhere, making a few bucks and getting on top of a few jobs. I hate to say it but sometimes having nothing to do can be a blessing, as we have caught up on a tonne of jobs that we have been trying to get done for 12 months. We will leave here cashed up and caught up, which will be all good. I am off call every second weekend which means heading off somewhere. Last weekend we were off to Alice Springs again and next weekend we will head off somewhere. It could be a lot worse. The location of this place is pretty good. There are plenty of other places around where there is just nowhere to go for weekends so we are fortunate. So we are about to embark on what we are really good at, or at least should be. Packing. 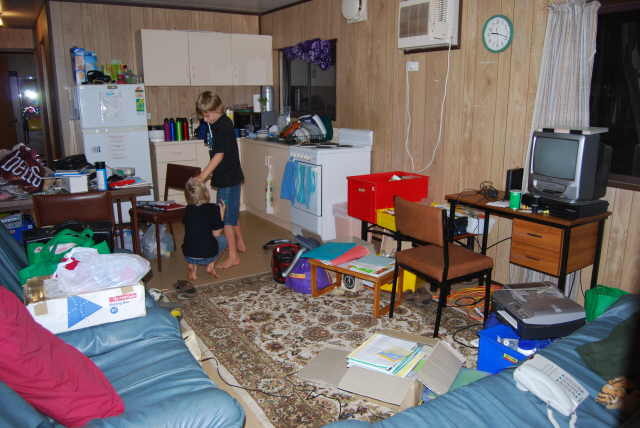 It is amazing that when you unpack something as small as a camper trailer and spread it out all over a house, the house seems full. Bloody hell, I hope it does go back. Stay tuned as we start the exciting trip west. Until next month - Stay safe.